Ever have problems remembering your keyboard shortcuts? 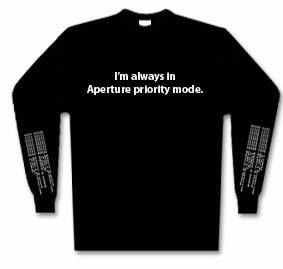 Some people just print them out and stick them to the monitor, while I go try use one new shortcut every day, but if you&apos;re an Aperture user, what you need is AUPN&apos;s long sleeve t shirt. Update - Aperture 2 has just sneaked out. I suppose I am surprised that it looks so unexciting, as if they&apos;ve copied a few of Lightroom&apos;s adjustments - Recovery, Vibrancy, Definition (ie Lightroom&apos;s lousily named Clarity which I always call Punch) - and then done a lot of tidying up to its remarkably fiddly interface. Proper DNG support so Aperture will now read files shot on a camera or camera back not natively supported by Mac OS X. If Adobe support it, Aperture will do so too. Given the recent fiasco over supporting new Canon and Nikon pro cameras, that&apos;s a very wise move indeed. There is no mention of importing IPTC-XMP, which would make it a lot easier for new users to migrate their metadata inwards, but it&apos;s even easier for people to leave Aperture as it now embeds IPTC data in RAW files on export. Background processing is now there, at least for exports like Lightroom, which should speed up end to end workflow. There&apos;s an option to use the embedded JPEG from camera when possible - that will speed up early comparison and weeding out duds. There&apos;s also a lot of good stuff like changing how Aperture searches within stacks - by default it now searches all items, not just the picks - and smart filters can now target adjustments - something I&apos;d love to see in Lightroom. But Aperture 2.0 looks like it&apos;s mainly about fine tuning and streamlining is clearly the buzzword. Streamlining&apos;s a very attractive word, but dangerous too, as if you&apos;re struggling for real excitement. And it&apos;s still limited to the Mac.